This past May, my daughter Marisa passed away from drug abuse, making 2016 an extremely hard year for me and leaving our family with very heavy hearts. I never thought any of my children would feel the need to experiment with drugs. I’ve always talked to them about substance abuse, and constantly let them know they could talk to me about anything. It’s easy to think something like this will never happen to us, and if it does, we end up trying to deny the situation or become embarrassed of the circumstances. The truth is, the drugs kids are now abusing today are extremely dangerous and easily accessible, leaving them feeling dependent on the drug and feeling helpless. Marisa once told me she felt her purpose in life was to help people, and while I didn’t quite comprehend what she meant at the time, I now know she couldn’t have been more right. Marisa may not be here on earth, but her memory will forever be eternal, and I’m hoping to live out her purpose through the Marisa's Purpose: Faith, Hope and Love Charity. My hope in creating this charity is that we can help as many people as possible stuggling with drug abuse in our local and surrounding communities. I’ve spent countless hours/days researching ways to not only get through to parents, grandparents, and students but also reach out to those who could be struggling with addiction. There’s so much information and so many resources, but thousands of parents, grandparents, sisters and brothers still remain uneducated and unaware of the drug epidemic occurring right in our community. While conducting my research, I came across an organization called, A Man in Recover (AMIR) - From Dope to Hope , whose mission is to save the lives of opiate addicts first, then provide new alternatives to keep addicts from relapsing. AMIR finds treatment for addicts within 48 hours (with or without insurance) and helps pay for treatment for those who are unable to. The foundation was founded by Tim Ryan, a recovering drug addict from Naperville, Illinois. Tim not only started the organization, but is also running addiction recovery groups for addicts and families and is the Chief Marketing Officer for Banyan Treatment Centers. He is a “sober coach” and frequently speaks to school groups, corporations and others who care to hear his message. 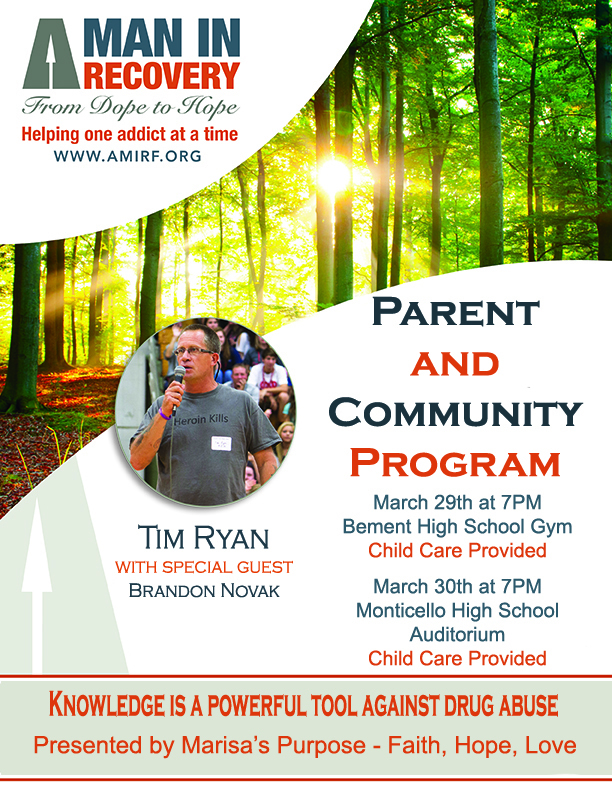 My goal for 2017 is to raise enough money to have Tim come to our community and surrounding communities to share his three unique perspectives on how to keep kids drug free. I truly believe that his experience and depth of knowledge will help educate families and am hopeful it will decrease substance abuse activity in our area. We need to give parents and kids hope! The fee for Tim to travel to our community and spend two days educating our middle school, high school students and parents is $5,000. I would appreciate any help I can get in reaching this goal, whether it’s a monetary donation or direction on how to make this happen. Once we meet our goal, all additional donations will remain in the Marisa's Purpose Charity. Thank you in advance for your time and generosity. 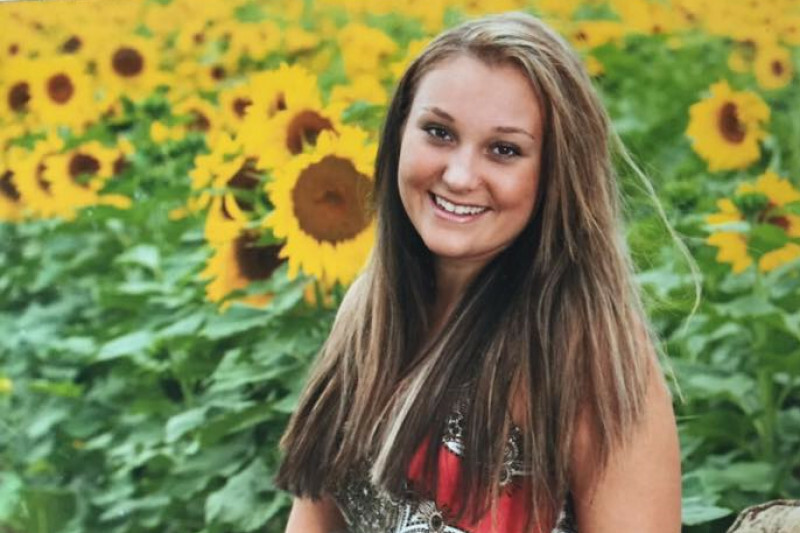 Donations can also be made to Marisa's Purpose Charity through First State Bank in Monticello. I hope you’ll join me in my crusade educating future generations and bringing hope to our community. May Marisa’s memory be eternal! On behalf of Marisa’s Purpose: Faith, Hope, Love, I would like to thank you all for your donations. On the generosity of donors such as yourself, we were able to bring Tim Ryan and Brandon Novak from A Man in Recovery to speak at 10 school events and two community forums in 2 days! The primary goal was to raise drug awareness in our community and to educate future generations. Without your support, this would have not been possible. We hope that you can continue to be engaged by visiting us at www.marisaspurpose.org and on Facebook. Knowledge is a powerful tool against drug abuse! May Marisa’s memory be eternal! Wednesday March 29th and Thursday March 30th. He will be visiting all the high schools and most of the junior high schools except Blue Ridge School, because they are on spring break. We encourage all Parents, Grandparents and anyone who would like to hear Tim's message to attend one of the evening presentation. Thank you for helping me reach my goal! I have a son that has been torn apart by addiction. Thanks for all your efforts. Cherish the memories of your beautiful daughter - take care and God Bless!